Chicken Salad with Apples is loaded with crisp apples, juicy oranges and red onions. The mouthwatering yogurt dressing with pickles makes this fall salad a big hit. Okay. Let me repeat. This is an awesome fall salad. It is like a fall bounty in a salad bowl. 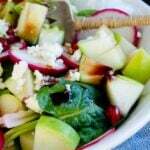 Do you love adding apples in salads? This recipe is for you! It has tons of apples. In addition, I used the season’s first oranges to complement both the flavor and crunchiness of other ingredients. Not grapes as you might have seen in several recipes. The result: Perfection! If you have leftover chicken, it takes no time to assemble everything. Make this chicken salad with apples recipe as soon as possible! I promise it will become one of your favorites. Oh and I must tell you that the yogurt dressing is to die for! You will want to make this salad again and again! Making this salad is almost effortless if you have leftover chicken. Just cut it into strips or cubes. We had no leftover chicken, so I cooked it from scratch using the same easy method as in my Keto Chicken Salad recipe. Because fall is the season for apples, we can find several types of apple at the market. I used three types of apples in this recipe: Granny Smith, Gala and Red Delicious. Use your favorite apples or whichever you find in your area these days. A tip for using apples in salads: Squeeze lemon over apples right after slicing. This will help them keep their color. Put the greens in the bowl first and top them with chicken, sliced apples, oranges and onions. I used a little flax seeds because I love to add seeds in my salad, but this is completely optional. Add as much dressing as you desire to the salad and serve. 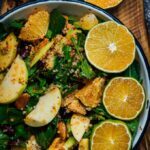 Although this chicken salad with apples and oranges is so good as it is, the tangy dressing turns it into an irresistible meal. It is a combination of plain yogurt, mayo, minced dill pickles, fresh dill and pickle juice. My mouth waters even when typing these lines. YUM! Serving extra dressing in a small cup along with the salad would be a good idea because I’m sure everyone will want more. You can use this same dressing for any salad you like. 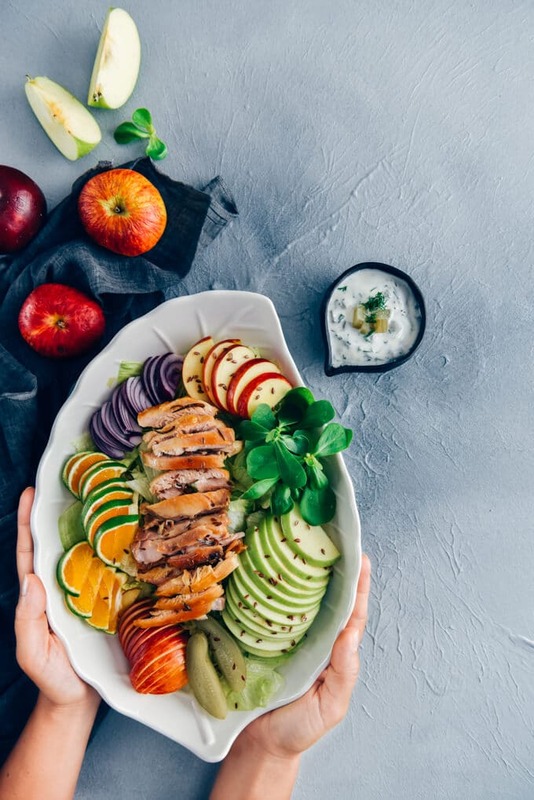 If you have a chance to make this Chicken Salad with Apples Recipe, I’d love to hear your feedback! Please rate the recipe and leave a comment below! 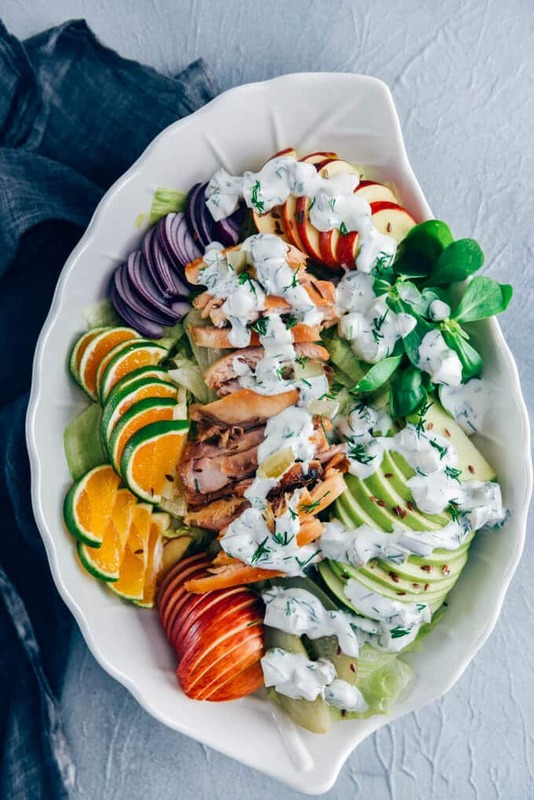 Chicken salad with apples, oranges, onion and an amazing yogurt and dill pickles dressing. You will want to make it again and again! Place chopped lettuce and purslane in a large salad bowl. Add onions, oranges, apples and chicken strips. Pour lemon juice over them. Sprinkle flax seeds. In a small bowl, combine yogurt, mayo and pickle juice well. Fold in chopped dill pickles and fresh dill. Pour it over the salad and serve.